The Rappahannock River, the longest free flowing river in the Chesapeake Bay watershed, extends from its origin at Chester Gap in the Shenandoah National Park of western Virginia to Stingray Point in the Chesapeake Bay, a total of 195 miles. Development of a water trail along a portion of the Rappahannock is being coordinated by the Friends of the Rappahannock in cooperation with the Virginia Department of Conservation and Recreation. The water trail will cover historical paddling trips from Kelly's Ford to the Fredericksburg City Docks -- the middle section of the river. 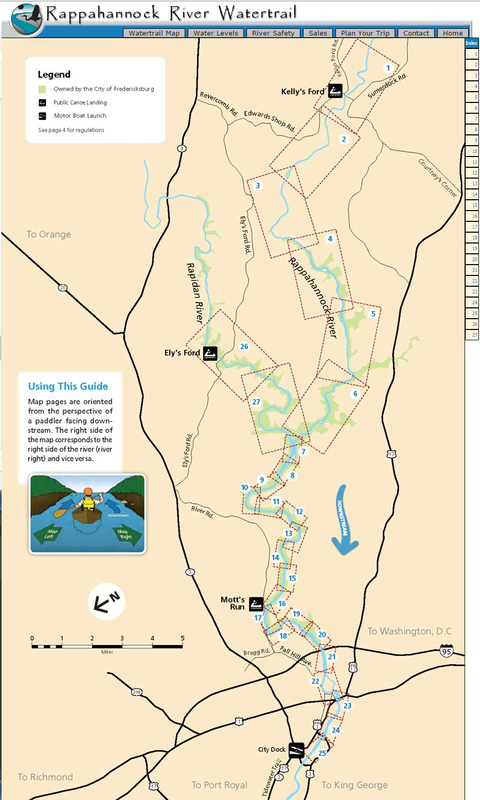 While there are many locations along the Rappahannock that are accessible for paddling and boating, the Rappahannock River Water Trail is still just developing. Boaters and paddlers are responsible for their own safety. Remember that boating, canoeing, kayaking and other activities on rivers can be dangerous. The section of the Rappahannock River from just below the Route 95 bridge to just below the cut stone abutment remains of the former 1854 Crib Dam and former concrete Embry Dam is open for Public Use. The former flat water area now consists of class I to III white water rapids which should be carefully scouted. Several areas of dangerous strainers (trees, brush and undercut rocks) can be found on the river's right side. River conditions can be expected to change due to the recent removal of the dams and related sediment. The Rappahannock River is now the longest free-flowing river on the United States east coast. Friends of the Rappahannock (FOR) Office and Water Trail Visitor Center is generally open weekdays 8:30 AM to 4:30 PM. Public river access sites are accessible during daylight hours whenever the official water level gauge near Fredericksburg, VA indicates the river is BELOW 3.2 feet. Check the current river level at the FOR web site and the current weather conditions upstream to avoid dangerous rising river levels. There are no fees for accessing Rappahannock River public landing sites in Fredericksburg area. White Water kayaking, Canoeing, Tubing, fishing, hiking, picnicing, bicycling, birdwatching, and historical tours are available at or near the river access sites. Restrooms are available at the Friends of the Rappahannock (FOR) Office and at local visitor centers. Boat launch, car-top paddling craft put-ins and free parking is available at designated public access sites. Local outfitters/outdoor centers provide appropriate equipment and transportation services on a fee for service basis. City of Fredericksburg and County Visitor Centers are handicapped accessible. The name of the river comes from an Algonquian word, lappihanne (also recorded as toppehannock), meaning "river of quick, rising water" or "where the tide ebbs and flows," the name used by the local native population, the Rappahannock tribe. Although there had been a few small hamlets along the lower Rappahannock during early colonial times, the settlement of the Rappahannock River valley began in earnest during the first years of the eighteenth century, at the urging of Governor Alexander Spotswood. The James River had been surveyed up to its fall line, the point where, geologically, continental bedrock of the Piedmont meets the sedimentary rocks and alluvial soils of the coastal plain. Spotswood encouraged settlement in a river valley other than that of the James. In 1714, he began soliciting immigrants from the Rhineland-Palatinate and Switzerland to homestead on lands he controlled near the confluence of the Rappahannock and the Rapidan. Known as the Germanna settlement(s), these villages were founded in order to exploit the iron ore deposits of the region. The Battle of Rappahannock River was fought on the river during the War of 1812. Seventeen British boats filled with hundreds of marines and sailors captured four Americanprivateers. During the American Civil War, the river, with few convenient fords and fewer bridges, provided a barrier and defensive line behind which movements of troops could be accomplished with little fear of attack from the river-side flank. It was an especially difficult barrier for Union troops to overcome in their attempts to thrust into southern Virginia. Control of the river changed hands many times during the course of the war. Significant battles fought along the river include the Battle of Fredericksburg and the Battle of Rappahannock Station. The defensive line at the river was finally circumvented by Ulysses S. Grant in the Wilderness (or Overland) Campaign of 1864, ending in the ultimate Union victory. In some 18th- and 19th-century documents, including some Civil War records, the Rappahannock River was referred to as "Hedgeman's River"; a 1736-1737 survey labeled the Rappahannock above the mouth of the Rapidan as "Cannon", and further upstream it was identified as "Hedgeman's River," named after Nathaniel Hedgeman, an early settler of the region.